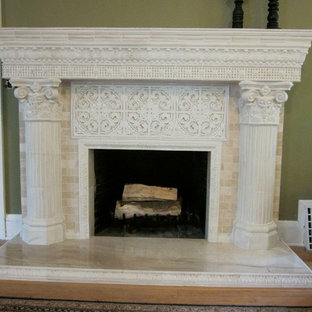 This tiled fireplace is in the brand new showroom for Castle Building & Remodeling, Inc at 2600 Johnson St NE. Designed by Katie Jaydan ASID Interior Designer. 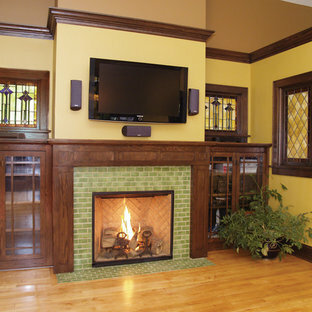 She chose 2" x 4" Avocado Field Tile to make the fireplace the center piece of this beautiful room. By Regan Baker Design Inc.
Textured tile from Spec Ceramics helped dress up this awkward corner fireplace without calling too much attention. 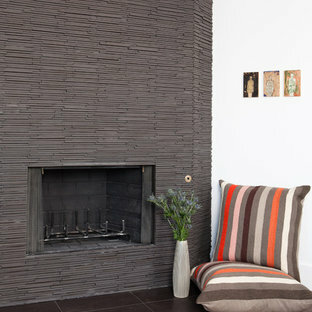 Hearth tile: Ann Sacks porcelain. By Westside Tile & Stone, Inc.
With two teenagers in the home, the homeowners wanted a space for entertaining both the adults and the younger set alike, a stone-clad bar and rounded seating area is set apart from the cozy movie-watching room next to it, but not completely secluded. 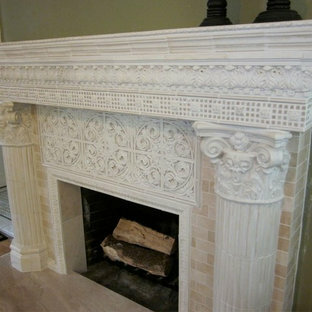 While renovating the master bedroom last year, the Mohrmans replaced the fireplace surround with white ceramic tile. Placed in a herringbone pattern, the tile and dark grout work together to lend a period feel to the room. As with many renovations, there were some surprises along the way. 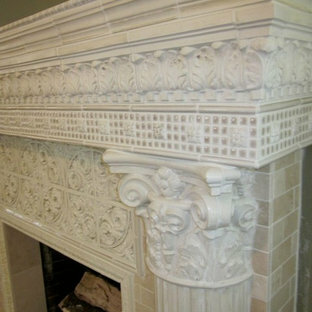 "From what we could tell the mantle had never been removed", Chelsea explains. "We removed the mantle and found bits and pieces of photos, ticket stubs, coins, etc that had fallen back there over the years. Some of the items were dated back to the 1930’s." Being the eighth owners of the home, it was hard to tell whether there was something there from every previous owner, "... but we gathered it all, placed it in a tin, added our own piece, and placed it back inside the mantle as a time capsule for future owners to find in decades to come." 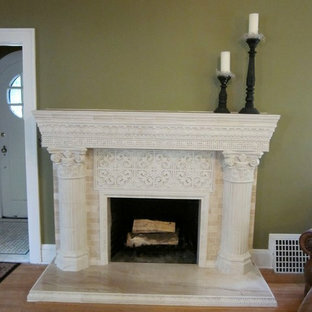 Close-up of home's original brick fireplace with ceramic tile hearth. This is an example of a rustic landscaping in DC Metro. The living room area of the lower level basement remodel for The Tate Barn.